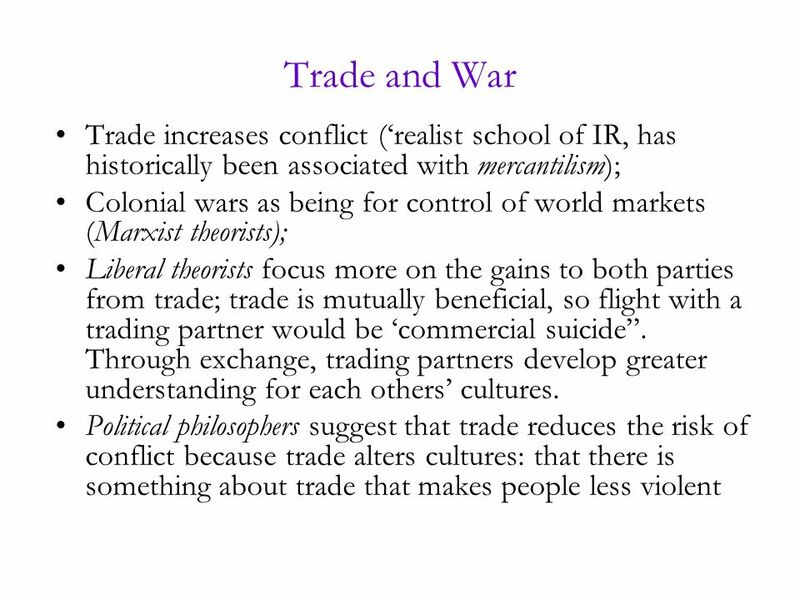 Economics of Conflict and Peace Topic 2: Peace and Conflict Factors in Economic Science Part 1: The Economic Origins of Conflict. 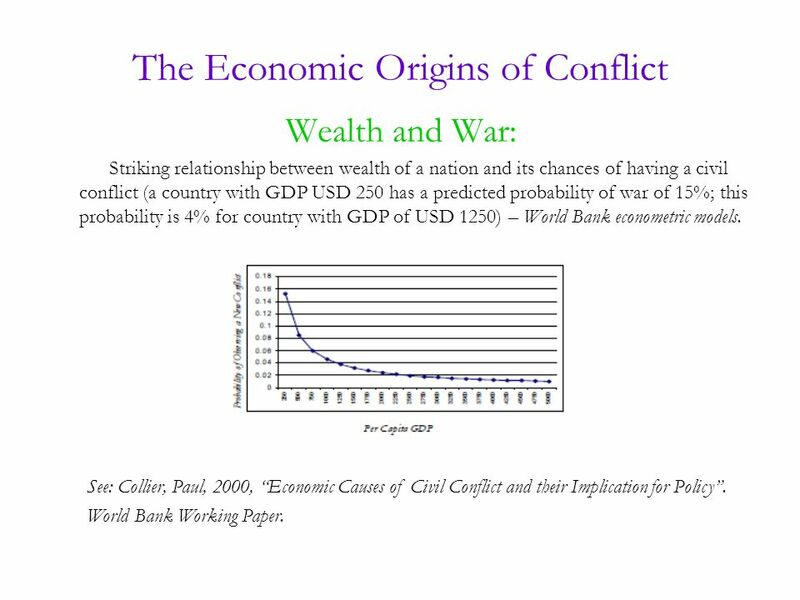 2 The Economic Origins of Conflict Wealth and War: Striking relationship between wealth of a nation and its chances of having a civil conflict (a country with GDP USD 250 has a predicted probability of war of 15%; this probability is 4% for country with GDP of USD 1250) – World Bank econometric models. 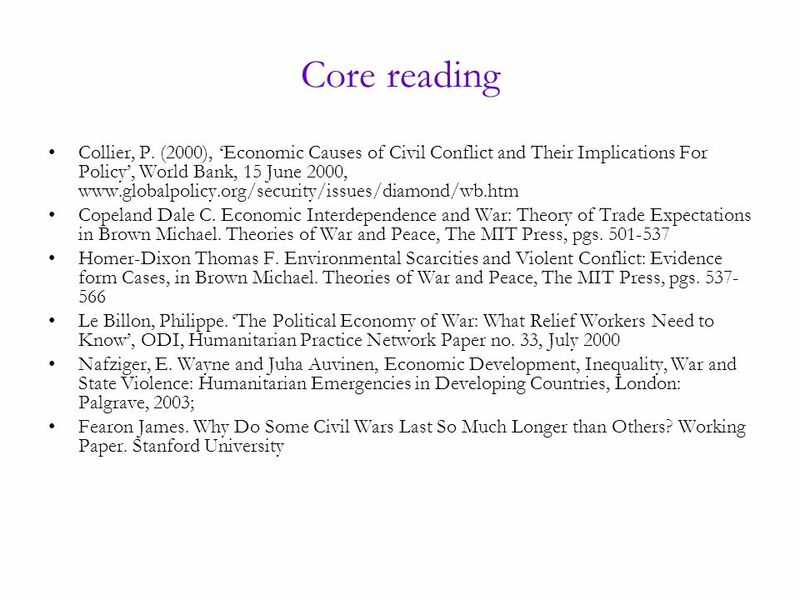 See: Collier, Paul, 2000, Economic Causes of Civil Conflict and their Implication for Policy. World Bank Working Paper. 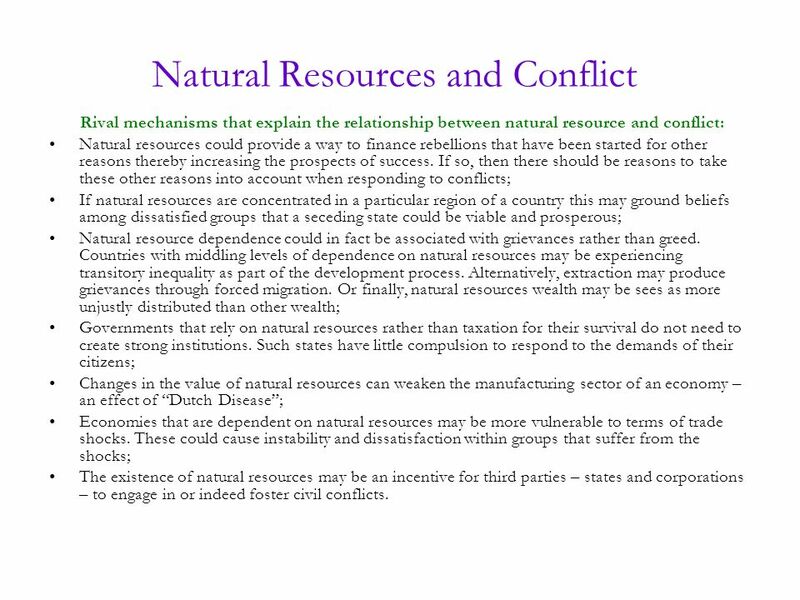 5 Natural Resources and Conflict Rival mechanisms that explain the relationship between natural resource and conflict: Natural resources could provide a way to finance rebellions that have been started for other reasons thereby increasing the prospects of success. 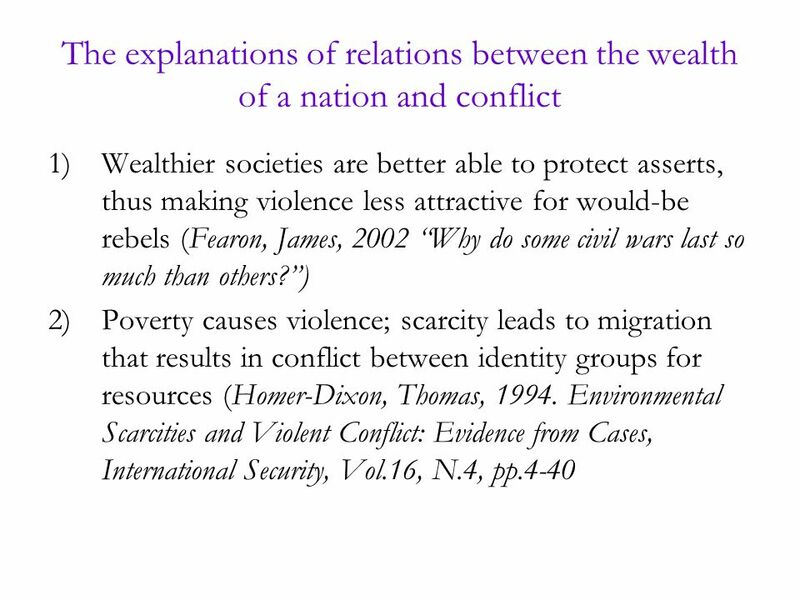 If so, then there should be reasons to take these other reasons into account when responding to conflicts; If natural resources are concentrated in a particular region of a country this may ground beliefs among dissatisfied groups that a seceding state could be viable and prosperous; Natural resource dependence could in fact be associated with grievances rather than greed. Countries with middling levels of dependence on natural resources may be experiencing transitory inequality as part of the development process. Alternatively, extraction may produce grievances through forced migration. Or finally, natural resources wealth may be sees as more unjustly distributed than other wealth; Governments that rely on natural resources rather than taxation for their survival do not need to create strong institutions. Such states have little compulsion to respond to the demands of their citizens; Changes in the value of natural resources can weaken the manufacturing sector of an economy – an effect of Dutch Disease; Economies that are dependent on natural resources may be more vulnerable to terms of trade shocks. These could cause instability and dissatisfaction within groups that suffer from the shocks; The existence of natural resources may be an incentive for third parties – states and corporations – to engage in or indeed foster civil conflicts. 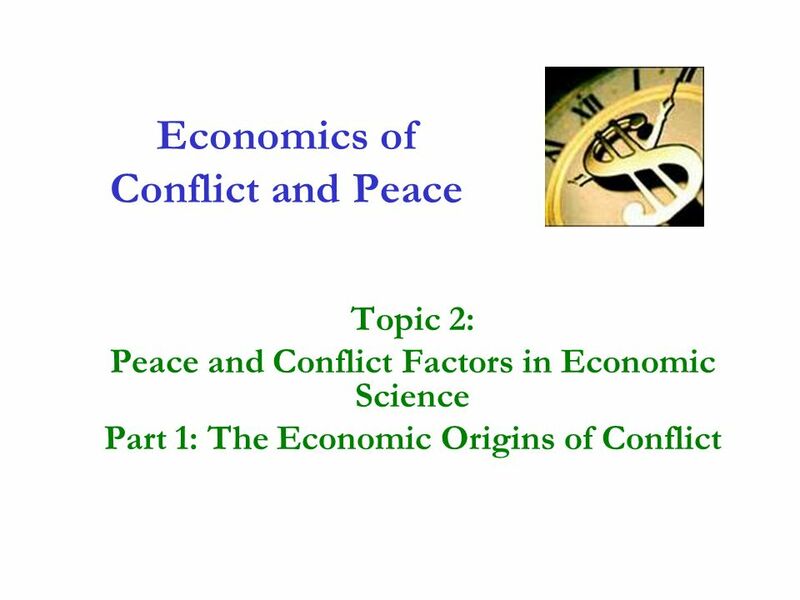 Download ppt "Economics of Conflict and Peace Topic 2: Peace and Conflict Factors in Economic Science Part 1: The Economic Origins of Conflict." Trade and Employment Challenges for Policy Research A joint study of. Trade and Inequality Nina Pavcnik Dartmouth College BREAD, CEPR, and NBER WTO-ILO Conference Research on Global Trade and Employment. INTERNATIONAL POLITICAL ECONOMY IR 2502 POLITICS AND IR UNIVERSITY OF ABERDEEN. 1 Economic Modelling Lecture 7 Convergence and Divergence in the Global Economy. Gender and Globalization Dr. Carl Davila The College at Brockport Gender, Power and Globalization S.U.N.Y. Global Workforce Project. “The Green Economy and the Caribbean: Issues, Ideas and Initiatives” Launch of the Caribbean Green Economy Action Learning Group Nicole Leotaud Caribbean. MANAGING VULNERABILITY AND RISKS FROM GLOBALIZATION AND TRADE LIBERALIZATION S.O. Akande, NISER, Ibadan Nigeria. International economics as a field of study in economics; one may ask: What makes economic relations among nation states different from economic relations. Centre for the Study of African Economies Development and Security Anke Hoeffler Centre for the Study of African Economies Department of Economics, University. 2 H i g h e r E d u c a t i o n © Oxford University Press, All rights reserved. 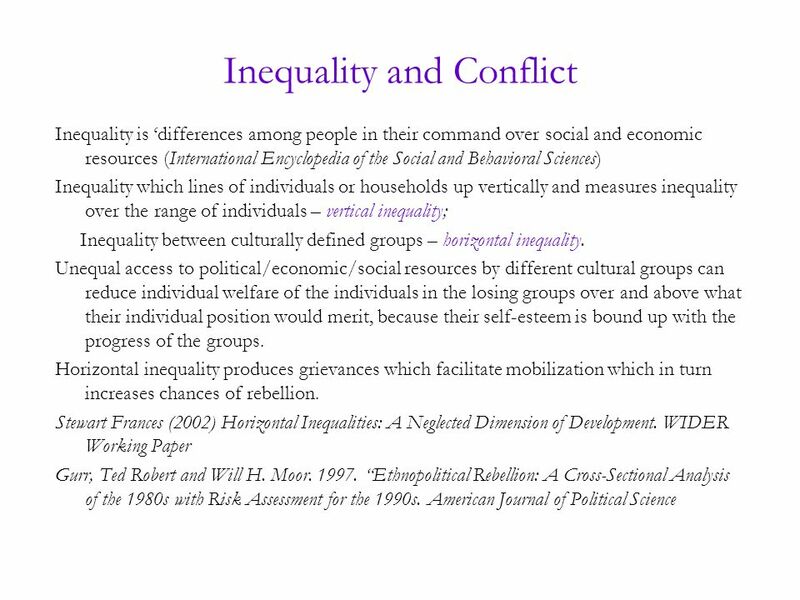 Chapter 3: Political theory: Social justice and the state Barr: Economics. Horizontal Inequalities in Southern Africa: An Overiview. Global Poverty 1 Lecture 22. Poverty and Global Inequality. The Extent of Poverty in America United States vs. Other industrialized nations – Relative poverty- not being able to afford.